Cooler Warehouses in Miami are HOT! ComReal Miami has recently conducted a study on refrigerated warehouse buildings in Miami-Dade County. The purpose was to identify both the total amount of refrigerated warehouses and the current availability. This report will better assist ComReal’s customers that are in the production and distribution of foods, beverages, pharmaceuticals, and perishables such as seafood, produce, fruits, vegetables and flowers. The conclusion is that there is an increasing activity and demand for cooler warehouses in Miami. Property Name Property Address Total Size in Sq. Ft.
For more information and/or a tour of the Sunburst Farms 53,000 sq. ft. warehouse space at Miami International Distribution Center, please visit www.MiamiCoolerWarehouse.com. 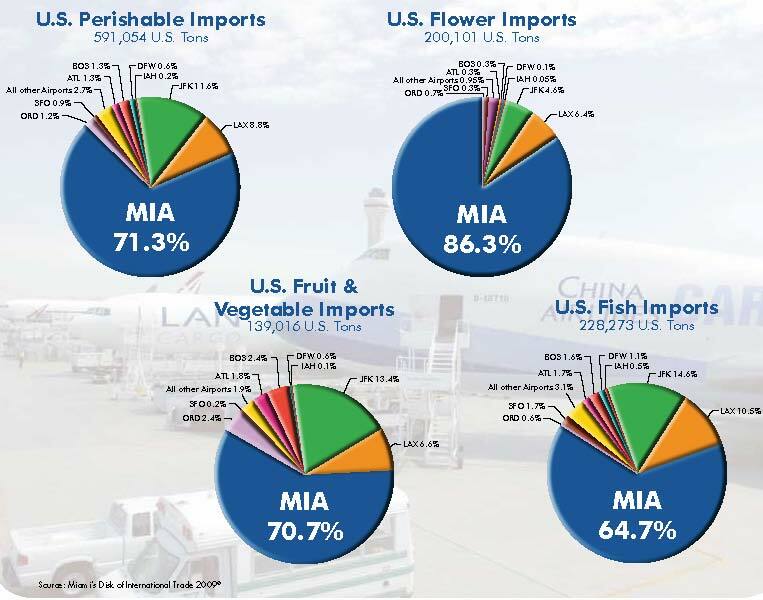 On a side note, according to the Miami-Dade Aviation Department, the Miami International Airport imports 69% of all perishables imported in to the United States. This equates to about 422,000 tons of air cargo that is made up of perishables including flowers, seafood, fruits and vegetables. (see Chart below). Mr. George Ackler with Centurion Logistics (aka Lynx Global Logistics ) now has a 800,000 sq. ft. refrigerated warehouse under construction on-site that will be delivered in 2012. The ComReal Companies have specialized in the commercial real estate industry in South Florida for over thirty years. Our Miami Industrial Division specializes in all warehouse property types including refrigerated, cold storage facilities. We recently represented Armellini Trucking with their lease renewal and expansion of their 100,000 sq. ft. refrigerated distribution facility in the Miami Airport West Dade sub-market. Please note that this study did not include the packing houses typically found in South Dade. For the more info and/or the complete report including details of available freezer warehouses, cold storage and cooler warehouses in Miami, please contact Ed Redlich, Vice President of the Industrial Division of ComReal Miami at 786-433-2379.